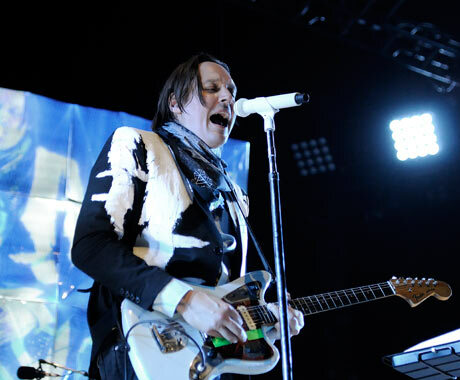 Just in case Arcade Fire didn't already have enough high-profile openers for their arena tour, the Canadian rock titans have added a few more big-name acts to the bill for their summer trip around North America. The new bands added to the tour are icons in their own right, since they include Television, Devo and Antibalas, with Pulp's Steve Mackey being tapped for a post-show DJ set. Unfortunately, all of these newly added acts are in the U.S., so Canadians will need to cross the border to catch the team-ups in person. Already announced artists on the tour include the Unicorns, Constantines, Spoon, Owen Pallett, Dan Deacon and tUnE-yArDs. See the itinerary below. These are apparently the last shows of the Reflektor tour. 08/29 Toronto, ON - Molson Canadian Amphitheatre *!